Easy installation, low maintenance, and all the visual impact. This heavy duty flagpole is built to do the job of a traditional one but with a more accessible design. The telescoping pole easily extends and retracts section by section and fits into a base that’s cemented in place. Bad weather forecasted? Take it down to store it away. 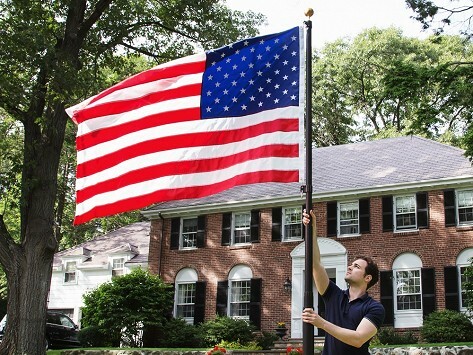 The flag clips on, so no ropes or pulleys needed—and no knots or tangles. Weight: 15' Silver and Bronze: 14 lbs. ; 20' Silver and Bronze: 20 lbs. I haven’t put it up yet, but this is my 3rd flagpole and it looks tough. Looks like this could be my last pole. Come spring I’ll know better. easy to install and very cool.. Worth the money.